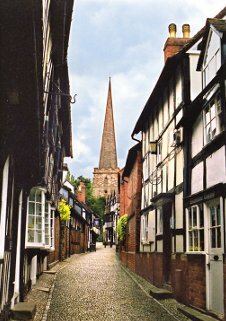 Ledbury is a great centre for a relaxing break. Whether you're an occasional cyclist, a mountain biker, or a keen road rider, there are plenty of routes to choose from. Unspoilt market town with historic heritage trail. Excellent choice of pubs, cafés and restaurants. Traditional high street with many family-run shops. Easy to visit by bike, car, train, coach or bus. On the National Byway cycling route. Wide range of places to stay. Rural area with rolling fields, cider orchards, and panoramic views. Flat routes for families - and challenging hills for enthusiasts. Outstanding network of quiet Herefordshire lanes. Maps of cycling routes on country lanes, and mountain bike routes on bridleways. Malverns By Mountain Bike (January 2019). The Malvern Hills Trust has launched a new map and guide to mountain biking on the Malvern Hills and Commons. They've also waymarked two bike trails, with a third one to come. For details click here. Electric Bike Loan Scheme (November 2018). We now have an electric bike available to loan out free of charge for up to two weeks, so that you can try out a modern electric bike before you buy one. For details please click here. If you would like to support us, please click below to make a card payment with PayPal .